The Complete Skizz is out this week! The ultimate illegal alien! Alan Moore’s out of print classic returns in a brand new complete collection! When Interpreter Zhcchz of the Tau-Ceti Imperium crashed his ship into the small blue “Hellworld”-classed planet, the odds of surviving were stacked against him. 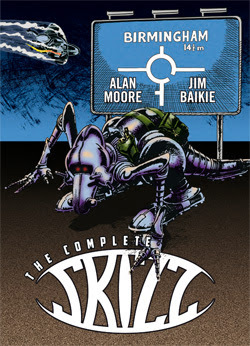 Stranded in the polluted, hostile British city of Birmingham, Skizz is befriended by Roxy, a plucky young local girl. But danger is ever present – from bad food to Prime Minister Thatcher’s hostile government alien-hunters, this E.T. may soon be R.I.P!